The stones were translucent orange. As we sat in the dark and watched them being placed one by one in the earth bowl, we knew this lodge would be hot and intense. It was a promise more than fulfilled. The heat and intensity, as with all sweat lodges, was also a reflection of the spiritual power of the participants and the potency of our purpose – to pray the Metta on this Spring Equinox day that all beings may have fresh clean water to drink, food to eat, a home, and someone to share love with. That they may know their true purpose, be well and happy, and free from suffering. In the womb cave that is sweat lodge, we began our ceremony by grounding and centering ourselves in the web of all life, our place in the universe. As is the way of lodge ceremonies, we called to and honored the four directions of the sacred Earth wheel. To the East and her knowledge of birth and new beginnings. To the the South and her knowledge of abundance and fullness. To the West and her knowledge of death, release and transformation. To the North and her knowledge of the dream time, of vision and inner wisdom. In this way we stepped into the circle of wholeness and harmony, the place from which sacred unfolding and manifestation is possible. 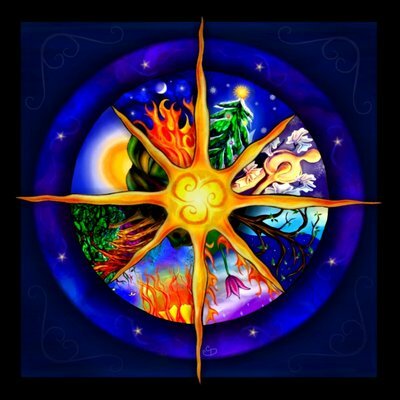 Whether in a sweat lodge or the Great Hall of Tara, spiritual people throughout time have invoked the power and presence of these great harmonious wheels and circles. Some call them medicine wheels. Some call them mandalas. Some call them sacred hoops. But the intention is the same. To touch and connect with the sublime knowledge and wisdom of the universe. To find our place. To remember who we are. To live in sacred harmony.